OPPENheim architecture + design has won approval for COR, a revolutionary Green building in Miami’s Design District. The project is a collaboration between Chad Oppenheim, engineer Ysrael Seinuk, and energy consultants Buro Happold. 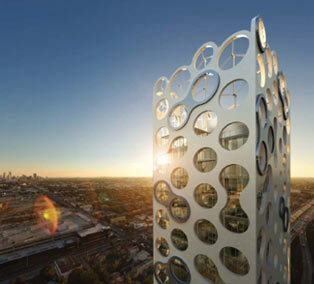 COR is OPPENheim architecture + design’s first sustainable, mixed-used commercial/residential tower. The building stands 400 feet tall and represents a dynamic synergy between architecture, structural engineering, and ecology. The design for COR recently received unanimous approval from the Urban Design Review Board of the City of Miami and represents Oppenheim’s strong commitment to Green design. The building will break ground in eight months. COR extracts power from its environment by utilizing the latest developments in wind turbines, photovoltaic panels, and solar hot water generation. A hyper-efficient exoskeleton shell simultaneously provides building structure, thermal mass for insulation, shading for natural cooking, enclosure for terraces, armatures for turbines, and loggias for congregating on the ground. The incorporation of all of these elements into one building represents a major breakthrough in design and engineering. Inside, COR features industrial-inspired spaces that are rooted in functionality and flexibility. Versatile, light-filled interiors and high-tech building infrastructure establish a unique balance between sleek professional spaces and comfortable residential spaces. Restaurants and retailers on the ground floor will add to COR’s urbanist personality; these businesses will allow the building to engage the street and create a dynamic venue for pedestrian interaction. In total, COR is poised to become an exciting new addition to the Miami Design District. The building has been designed to address the needs of creative, design-oriented businesses and individuals that personally and professionally identity with the hip and sophisticated ambiance of the neighborhood.